This past week has been a rough one for the Underdog’s Family. We lost our own very beloved furry friend Prim this week due to complications from a sudden seizure. It’s been a rough week for us all and we miss her very dearly. A fuzzy Prim just after she was groomed. While we only had her for two years, and knew her time with us was likely to be shorter than had we adopted a younger dog, the hurt after her passing was just as strong as if we had cared for her throughout her entire life. You know when you adopt an older dog that they will not get to be with you as long as if you had adopted a new puppy or spry youngster. But old dogs are so appreciative of the basic kindnesses in life. Prim had a very rough life before she got to us. And we were able to provide for her the last three years of her life with good food, good treats and mountains of love. And that’s the best part about rescuing. Welcome to our first official dog related blog post of 2019! I forgot to mention in our last column that we’re switching it up a bit this year with these educational blogs. As we’re expanding our mission out and ramping up our educational and training efforts, we’re going to be reducing our community blog posts to the first Friday of every month. I know that’s disappointing for those of you who enjoy these, but this will allow us more time to do deep-dives into specific topics or interests as well as allowing us to add in other forms of media on our page like training videos and photos from our sessions. But without any further ado, enjoy our first deep-dive blog into the world of service, emotional support, and therapy dogs! There’s been a lot of buzz in the news lately about service dogs. There have have even been recent lawsuits (see this washington post article) in which people in need of service dog are scammed and given untrained dogs instead. To the expensive (and life threatening) tune of over $25,000 a dog. I think there are a lot of misconceptions about what a service dog is, and where someone with a service dog can go. There’s now even a semi-new term called an Emotional Support Animal which further complicates and obscures the line between a service dog and a pet. Then there’s the whole other category of the happy go lucky therapy dogs that run up to you for some extra loving. Let’s dive into a few of these points of confusion and see what we can figure out. The first thing is what is a service dog? The Americans with Disabilities Act (ADA) defines a service animal as an animal that has been individually trained to do work or perform tasks for an individual with a disability. The task or tasks that are performed by this animal must be directly related to the person’s disability. So for example someone with diabetes could use a diabetic alert dog to help them know when their blood sugar is dangerously high or low and alert them to this issue. There is an important distinction between a service dog and other terms describing dogs that provide support. These other terms might include an emotional support dog, a therapy dog, a canine good citizen dog, a companion dog or simply a pet. These types of animals differ from a service animal, because they aren’t training to perform a specific task or service for an individual. Instead these dogs, lovingly and happily, perform their doggy duties providing comfort and companionship to the humans they love. Is this a service dog? What work or service task has this dog been trained to perform? That’s it. Service dogs do not need to wear a vest. They do not need to carry an ID card. They do not need any patches or labels. They do not need to be registered or have paperwork. They only need to be trained to provide a service or assist in a task in partnership with their human who has a disability. Their humans are also protected. The human handlers do not have tell anyone which disability they have. They do not have to carry paperwork describing or detailing that disability. They do not have to prove that their dog is a service dog with an id card or paperwork. These people (and their dogs) are afforded the same rights of access as any other person, even though they do so in partnership with their service dog. Service dogs can come in all shapes, sizes and breeds. There are no restrictions to what a service dog should look like. Sometimes smaller dogs work better for certain disabilities or might be easier for children to handle. Other times people benefit from having a larger breed of dog who is more capable of performing other duties like providing stability when their person is walking. Additionally while service dogs can be exempt from breed specific legislation (aka banning a certain breed from living in a certain area), they still must follow all local laws regarding vaccinations and dog registration. Service dogs must also be under control of their handler at all time. And this is oftentimes one of the easiest ways to spot a fake service dog. Service dogs, due to the level of training they receive (oftentimes years), will not act like many of our (beloved) pets do. They don’t bark excessively, or chase squirrels, or run off to play with friends and ignore us entirely! Instead they stay nearby their human performing whatever needs they require. It is for this very reason you should never pet, or distract or engage with a service dog while they are out in public. Distracting a service dog can literally mean life or death to the handler. A seizure alert dog being distracted and petted by an enthusiastic dog lover, might miss the early signs of a seizure coming on causing their handler to be unprepared and be injured by the resulting fall. We all love dogs. But please let service dogs do their jobs. They love their humans. They love their jobs. And they need their full attention focused on doing both of those things. Next we come to the sad fact that because of the many “privileges” that are granted to service dogs – namely the access to any place their human goes, people oftentimes take it upon themselves to claim that their dog is a service dog when it is clear that he or she is not. While I can understand the desire to be able to take your dog wherever you go, especially if you have a mild mannered or well trained dog, our dogs are not service animals. Therefore we cannot treat them as such. There’s also many “certifying agencies” that claim by paying a fee from a few dollars to over a hundred you can register your dog a service dog. Just google “register service dog” and you’ll find tons of them. These “certifying agencies” (which are not approved nor required by the ADA) simply collect these fees in exchange for providing you a worthless registration id card, certificate and a dog vest with a patch that says “service dog”. As we mentioned above, these three items are again not required nor needed for a real service dog and muddy the waters as to what dogs are actually providing life saving support to their humans and which are only companions causing issues. In researching this article, I was actually impressed by the amount of issues having non-service dogs interacting with service dogs could cause. Let’s look at a few examples of these to understand the impact. A service dog is trained to ignore other people and dogs, but as we know from training our own dogs, teaching your dog in the comfort of your living room vs teaching your dog in the middle of an active dog park are two different things. Don’t get me wrong, having a service dog traverse through a busy shopping mall is beyond impressive, but having that dog deal with all that stimulus, watch over their human AND ignore the crazy barking banshee of a dog across from them is a whole new level of challenge. Distracted service dogs endangered their humans and prohibit the dog from doing their job. Some trainers of service dogs too brought up that service dogs are frequently selected based on their calm demeanor and easy nature. These dogs are smart, capable and cool under stressful situations. But that does have a down side, they’re typically a wimp when it comes to a fight. There have been numerous service dogs who have been attacked by other “service” dogs that were later proven to not actually be service dogs but simply regular household pets. This is especially impactful to the service dog handler who in the best case scenario has lost some freedom and independence while their friend heals, and worst case is now at risk of death or injury because they have no other means to handle their disability. 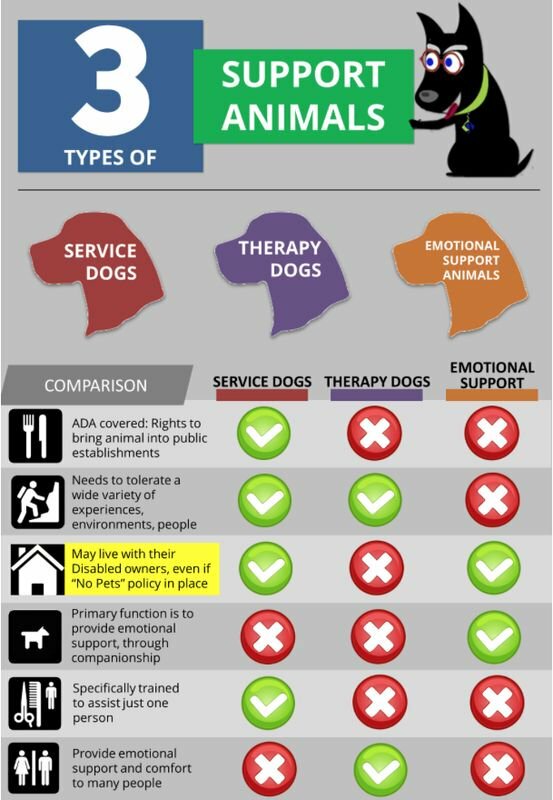 The two other categories that oftentimes get used interchangeably with a service dog are emotional support animals and therapy dogs. I will briefly cover a definition of both of these terms so we can all know how to use these terms correctly. An emotional support animal (ESA) is an animal designed to provide comfort and not a service. In order to qualify for an ESA you must have a letter from a psychologist, therapist, psychiatrist or other duly-licensed and/or certified mental health professional that certifies you as emotionally disabled. As we stated above, ESA animals are not heavily trained to provide a specific service or task but are simply designed to provide comfort to their humans who have some psychiatric or emotional need. ESA laws are defined at the state level not the federal level like the ADA, so be sure to look your local state laws up. In Iowa ESA animals are not provided the same unrestricted access that service animals are. They cannot go everywhere their human goes. They can however bypass some housing restrictions such as a “no-pets” policy. Finally the last core category of dogs are therapy dogs. These dogs are trained to provide comfort to other people and are frequently brought into community areas like retirement homes, schools, hospitals, etc to provide comfort to the individuals living or staying there. These dogs are typically trained to deal with a lot of the unique circumstances they will encounter in their volunteer duties (like wheelchairs, or walkers or oxygen masks) but will then go home and be off duty and just another fun loving pet. Some hospitals or other agencies in which these dogs will visit might require specific training or certifications to visit, but in general there is no overarching certification to become a therapy dog. Therapy dogs are also not permitted to accompany their humans wherever they may go and are also not exempt from housing restrictions like a “no-pets” policy. Whew, so it’s a lot more complicated than you might expect. I do hope you’ve learned something new about the wonder ways dogs support our lives. I know I sure have. Now the question remains: What do you think the best approach to handling the increase of fake service dogs is? Leave a comment below with your thoughts and suggestions! A New Year of Changes! 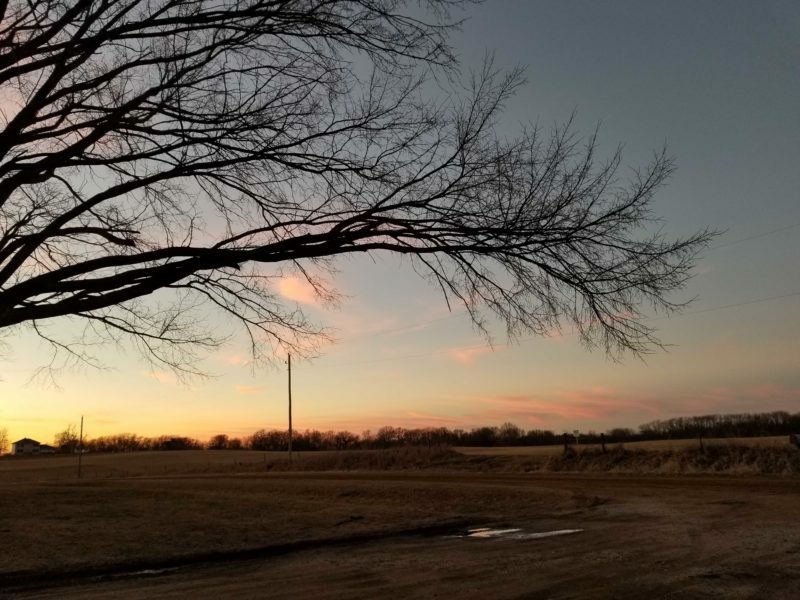 As many of you are already aware, my fiance and I moved from Luther to just outside of Jefferson this past week to our new acerage. While we still have loads of boxes to unpack (seriously how does Esther have a whole box of toys!) we are still very excited about the possibilities this new place brings us. This move will not affect the areas that Underdog’s Triumph serves and we are excited to share with you our progress through 2018 and our hopes/dreams for 2019! We learned a lot last year as our first full year of being a non-profit. In 2018 alone, we did over 50 hours of private training with folks in the community helping them with all sorts of issues from fear/reactivity/aggression to basic household manners and puppy classes. We saw great changes being made by all our clients as we helped teach them more effective ways to communicate and train their pets. We sadly lost two awesome board members who had to move away to the much more mild-weather state of Oregon. But we also gained two new board members! A couple, Megan and Oliver Jensen, joined Underdog’s Triumph. Megan has had a lot of experience working with educational programs and has a fearful/reactive dog herself whom she’s been doing a lot of work with. She brings a lot of dog training knowledge to our board and this year wants to start working towards taking on new clients as well! She’ll be shadowing on some our cases to see how she likes it! Oliver who is a co-worker of mine from Workiva (my “real” job) and he is bringing some more technical experience to the board and will be helping manage a great deal of our website and online presence to allow the rest of us to focus on our new mission. As for our mission, we’ve been doing a lot of soul searching as to how Underdog’s Triumph can best help out the community. There is already a large shelter presence in the area provided by the ARL in Des Moines/Ankeny, the Ames Animal Shelter, and Boone Area Humane Society, so we have put aside our goal of opening a new facility for the time being. Instead we’ve been focusing on the educational part of our mission. This year we’re going to be focusing on addressing the bountiful amount of outdated and/or incorrect information floating around how to interact with and teach dogs. Outdated methods like choke chains, prongs, and shock collars are making a come-back and people, who don’t know any better or are misinformed, are being told they’re the only option for “tough” dogs. We’ve been working to provide our clients with updated information on dog training methods and teaching them a kinder way to approach and interact with their pets. Using the force-free methods (positive training) we teach, our clients are able to have a better, and stronger relationship with their dog, and get the long lasting changes they want to see without any of the harmful effects that come from force or pain based methods! The second area we’re going to be focusing on this year is our partnerships with other area shelters. As those who are familiar with the rescue community, shelters and rescues oftentimes struggle just to make ends meet and keep their doors open. “Extras” like educational programs or community outreach are often the first programs on the chopping block as the animals will (and should) always come first. We’re looking to start up two awesome programs. One will be geared towards shelters and rescues in the area (Ames/Boone/Jefferson) to provide a “Force Free Starter Pack” of tools & training to these facilities (please contact us if you are a member of a rescue/shelter in the area who is interested!). The second will be a “Trade Up” program where we seek to remove harmful/pain based tools from the community. Our intent is to pilot a Force-Free/Positive Training Starter Pack in partnership with a local animal rescue/shelter. We would like to start with a local shelter and then expand to other semi-local shelters in the area. For these packs, we would prepare a semi-customizable set of training tools and enrichment toys to donate to the shelter. Then, we follow up this donation with an in-person educational program to teach shelter staff and volunteers the benefits and impacts of force-free training and how they can apply these new concepts/tools in their shelter work. After the staff/volunteers are trained, we propose a partnership event open to members in the community. This would consist of a similar curriculum except with focus being on the needs of dogs in a home environment vs their needs in rescue/shelter. The second program, “Trade Up” is designed to help owners currently using aversive tools gain access to force free tools instead at no cost to them. During our training sessions, if a client currently uses prong or choke chain we will offer them a “trade up” to exchange these aversive tools for a brand new front/back clip harness. This helps get aversive tools out of the general population and increases awareness of the safety and effectiveness of non-aversive tools like a harness. We will also provide education on how to use a management tool like a front clip harness to aid in training as well as provide information on the risks associated with using aversive tools. We hope to have some public “exchange” events as well where folks can exchange these tools in person for new more modern ones! All in all, while we’re in a new location the area we serve and our mission will remain as strong as ever. We look forward to continuing to provide training focused blog posts bi-monthly (1st/3rd Fridays) to our readers, in person private home sessions at low costs and improve our community outreach via the two programs described above. Thank you for joining us in 2018 and we look forward to serving you and the community in 2019! Surprisingly 77% of all bite case come from dogs the children know. These are often family pets or friends of the family who despite trying to tell their beloved humans they were feeling uncomfortable were pushed past their tolerance level and bit someone. 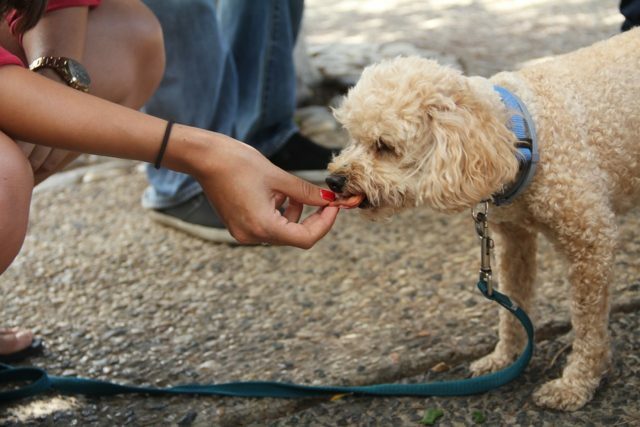 Through this program, kids will learn safe ways to approach and interact with dogs (familiar and unfamiliar), and how to minimize their bite risk. 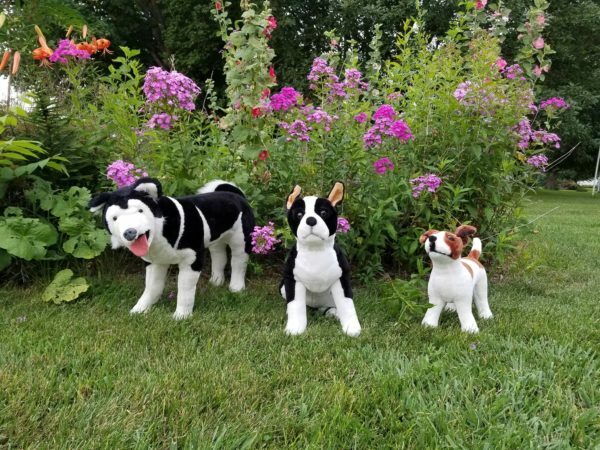 Underdog’s Triumph will be presenting an interactive slide discussion where kids (and their parents) will learn to look for stress/calming signals that dogs display hen they first start to feel uncomfortable. These key warning signs come before a dog growls and before they bite, and can help kids and parents know when their dog is telling them they need a break. Knowing and recognizing these signs can help kids avoid pushing their dogs or their friends dog past their tolerance level to where the dog feels a bite is their only hope. Take a sneak peek at Shelby’s photos below. These are of the same dog at two different times. Which of these two dogs is okay to pet? To a child (or other dog ethusaist) it is oftentimes hard to see the signs, especially when the child (or adult) is eager to meet a new friend. But looking closer at these two still photos you can pick out some of the signs. Through interactive discussions, the children (and parents) will learn how to see these signs and learn how to avoid pushing a dog past his or her tolerance. Parents will also be getting a handout discussion packet to take home to continue working with their children on recognizing these key signals. If you are interested in hosting another event similar to or like this, please use our contact form here to set something up. We’re eager to work with other organizations, like schools and libraries to get this important information out there!